I came across this recipe for sweet corn fritters a couple of days ago and gave it a try today. It tastes really good. It is from a Thai recipe book as per the owner of this recipe.. give it a try.. its nice and something very different at least for me..
1. 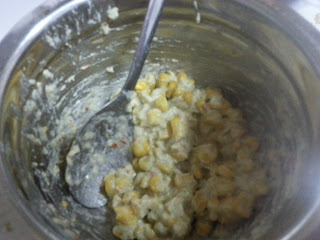 In a microwaveable bowl with lid, add the sweet corns direct from freezer and microwave for 1 minute. Do not add any water. Stir and repeat this four times ie 4 minutes in total. If using fresh corn kernels then do the same but with one tablespoon of water. 3. In a mixer add the shallots, garlic, dried red chilli, coriander leaves and 1 tablespoon of water. Grind it coarsely. 4. In a mixing bowl add the corn kernels, coarsely ground mix, all purpose flour, rice flour, salt and pepper and mix well. Add 1/2 tablespoon of water if needed. 5. 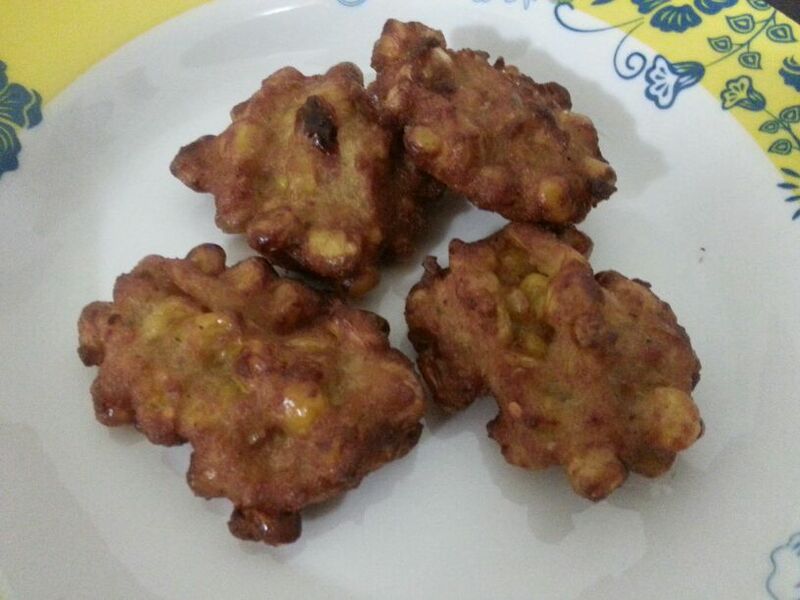 The consistency should be of vada batter. Add flour or water to adjust accordingly. 6. Heat oil for deep frying. Reduce heat to medium once oil is hot. 7. Either make patties with wet hands or drop spoonfuls of the mixture into the oil. 8. Fry on both sides till it is golden in colour. Drain on paper towels. 9. Stay a bit cautious as the corn may pop if the oil is too hot.